In today’s economy, everyone is looking for ways to save a few pennies while keeping as many of their luxuries as possible. For those of you who love to listen to a lot of music but don’t want to pay the piper for the privilege, I suggest Spotify. Spotify is a internet music database filled with thousands of songs, plenty of device applications, and a minimum number of ads. With price options ranging from free to $9.99/month, Spotify is a deal for music lovers. Spotify is an online library with access to millions of songs which can be accessed through your computer, phone, or Android. You don’t have to worry about eating up your data plan either—Spotify allows you to download your playlists to your phone so that you can take them on the go without drying up your data plan or overloading your wireless. Spotify is a great alternative to Pandora because it allows you to build your playlists yourself, and also includes shorter, less frequent ads. Another pro (or perhaps a con, depending on who you are) is that Spotify gives you the option to log on through Facebook and Twitter so that you can see what your friends are listening to and your pals can see what you’ve been listening to. You can also “share” a track or playlist with your friends, making it extremely easy to trade music without infringing on legal issues. Spotify has three tiers of plans: $9.99/month, $4.99/month, and free. 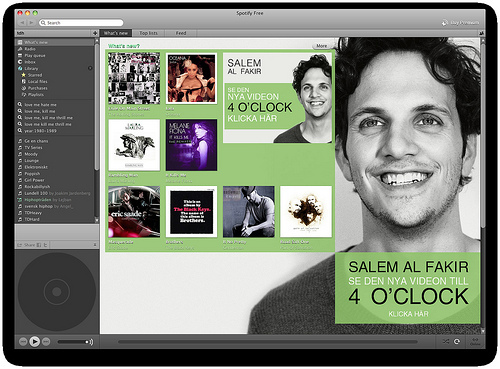 Spotify allows first time users to utilize the Spotify Premium services free for the first six months. This means unlimited streaming and access to your playlists on mobile devices, though you still will hear the occasional advertisement. However, once the six months are up, users can play a track a maximum of five times in one month and are limited to 10 hours of streaming music per month. Depending on the playlists that you’ve downloaded to your computer during the six month period, this may or may not be a problem, but it is certainly a nuisance. After this point, you can dish out $5.00/month to listen without these limitations and without ads or go the whole hog and get the $9.99/month plan. 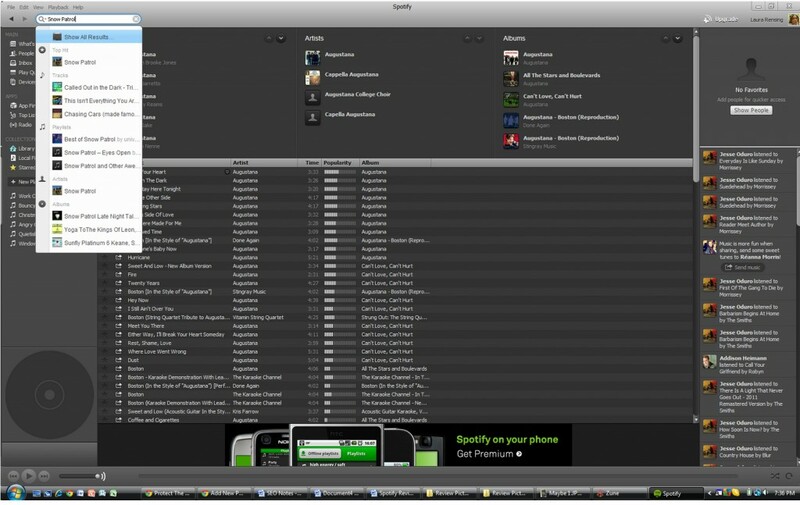 Spotify has a huge variety of artists, albums, and playlists, all easily searchable. For the price, Spotify is a fantastic library that allows you to listen without too much commitment. If you love to listen to a lot of music all day, every day, then the paid plans of Spotify are a fantastic deal when compared to the price lists of iTunes and Amazon.com. If you are not an avid music listener, then the free version will be sure to have singing your own happy tune when you think about the money you’ll save.